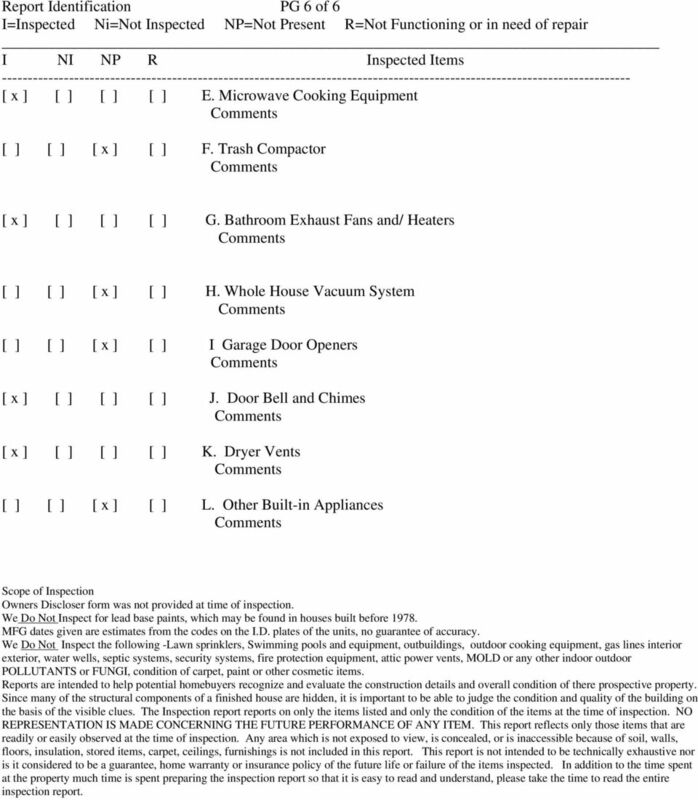 Download "I NI NP R Inspected Items"
2 Report Identification PG 2 of 6 Additional pages may be attached to this report. Read them carefully. This report may not be complete without the attachments. If an item is present in the property but is not inspected, the NI column will be checked and an explanation is necessary. may be provided by the inspector whether or not an item is deemed in need of repair. I. Structural Systems [ x ] [ ] [ ] [ ] A. Foundation [x ] Block Pier and Beam -The pier and beam foundation shows settling to the interior piers. In several rooms settlement is measured toward the interior of the home. This structural movement has caused several interior sheetrock cracks which are seen in the walls. Note: the foundation has been previously shimmed and leveled in areas. Repair method Settlement is generally alleviated by mechanically raising the beams, removing existing piers, sustaining the beam position and installing new supporting piers. Foundations are also leveled by using shims on the existing piers. The shimming process will not guarantee against future recurrence of interior settlement because the problem has not been resolved. The shimming process is relatively inexpensive and, as the rate of settlement decreases with time, the bearing soil beneath the pier will eventually compact. -The 2x8 floor joist have a long span under the living room and dining room. Some deflection is measured in the joist recommend installation of a girder. -The 2x6 block which has been used to support the girder should be replaced with a block pier. [ x ] [ ] [ ] [ ] B. Grading and Drainage [ x ] [ ] [ ] [x ] C. Roof Covering Type: [ X] Composition [ ] Flat [ ]Metal -Roof inspect from roof level ground and under roof in attic. Note: This limited visual inspection is not a certification or warranty that the roof will not leak. Water penetration resulting from wind driven rain or severe weather conditions cannot be determined until they happen. According to the National Association of Home Builders 90% of all roof leaks occur due to rusted flashing, exposed nails, roof mounted flue pipes ventilators or chimney flashing. -The roof covering is a composition over wood shingle. The cost of future roof replacement will include removal of all roof coverings and re-decking the roof. [ x ] [ ] [ ] [ x ] D. Roof Structure and Attic Note: Limited access due to stored items and insulation -0 of insulation is present, insulation in the attic is needed. -A depression is observed at the front and rear slope of the roof and in the front valley over the master bedroom as seen from the exterior. -The cause is excessive spans in the 2x4 rafters recommend installation of addition purling bracing and sistering the rafters when the roof covering is replaced. -Ceiling joist over the master bedroom have been replaced. -The attic latter needs to be properly secure with 16D nails through the hinge plates. 3 Report Identification PG 3 of 6 [ x ] [ ] [ ] [ x ] E. Walls (Interior & Exterior) -Several minor interior sheetrock cracks are observed. These cracks are likely due to foundation settling. 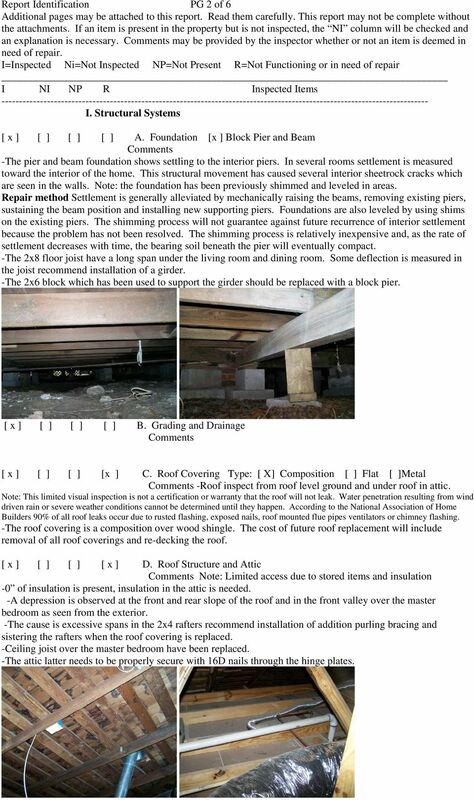 Note: For the report on termites see the WDI report [ x ] [ ] [ ] [ x ] F. Ceiling & floors -The floors are unlevel in areas. [ x ] [ ] [ ] [ ] G. Doors (Interior & Exterior) [ x ] [ ] [ ] [ x ] H. Windows -Two right side dining room windows are cracked. [x ] [ ] [ ] [ ] I. Fireplace [ x ] [ ] [ ] [ ] J. Porches, Decks & Carports (Attached) [ x ] [ ] [ ] [ x ] K. Other -The stairway steps have the improper tread depth. -The stairway guardrail is too low at 31 inches. 5 Report Identification PG 5 of 6 IV. 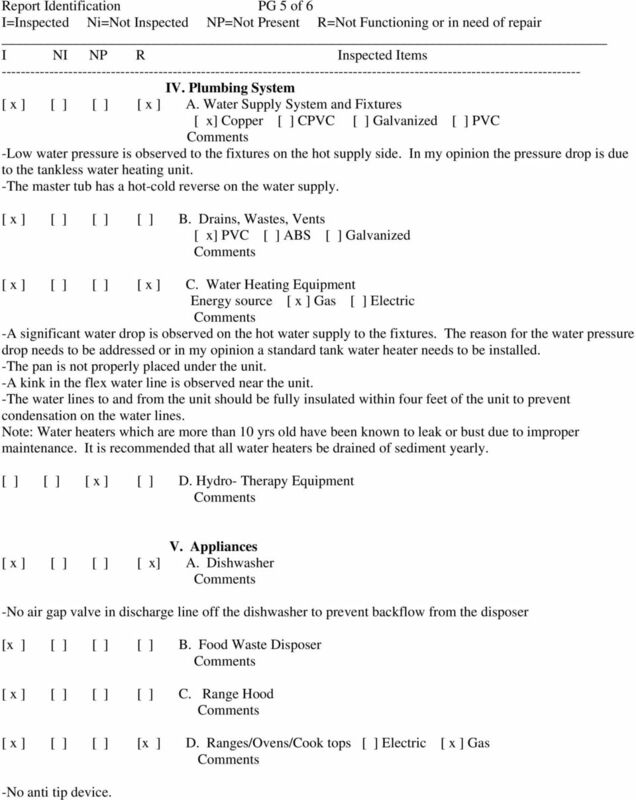 Plumbing System [ x ] [ ] [ ] [ x ] A. Water Supply System and Fixtures [ x] Copper [ ] CPVC [ ] Galvanized [ ] PVC -Low water pressure is observed to the fixtures on the hot supply side. In my opinion the pressure drop is due to the tankless water heating unit. -The master tub has a hot-cold reverse on the water supply. [ x ] [ ] [ ] [ ] B. Drains, Wastes, Vents [ x] PVC [ ] ABS [ ] Galvanized [ x ] [ ] [ ] [ x ] C. Water Heating Equipment Energy source [ x ] Gas [ ] Electric -A significant water drop is observed on the hot water supply to the fixtures. The reason for the water pressure drop needs to be addressed or in my opinion a standard tank water heater needs to be installed. -The pan is not properly placed under the unit. -A kink in the flex water line is observed near the unit. -The water lines to and from the unit should be fully insulated within four feet of the unit to prevent condensation on the water lines. Note: Water heaters which are more than 10 yrs old have been known to leak or bust due to improper maintenance. It is recommended that all water heaters be drained of sediment yearly. [ ] [ ] [ x ] [ ] D. Hydro- Therapy Equipment V. Appliances [ x ] [ ] [ ] [ x] A. Dishwasher -No air gap valve in discharge line off the dishwasher to prevent backflow from the disposer [x ] [ ] [ ] [ ] B. Food Waste Disposer [ x ] [ ] [ ] [ ] C. Range Hood [ x ] [ ] [ ] [x ] D. Ranges/Ovens/Cook tops [ ] Electric [ x ] Gas -No anti tip device. 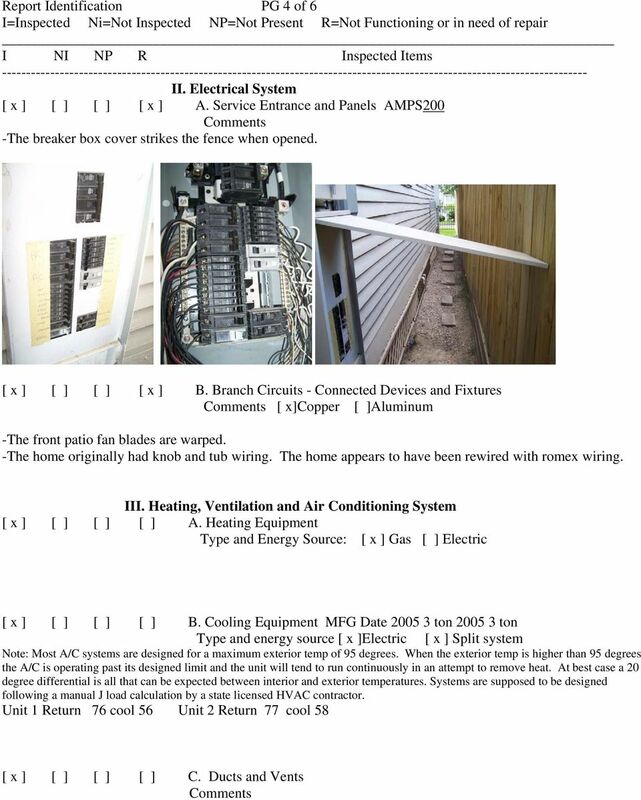 6 Report Identification PG 6 of 6 [ x ] [ ] [ ] [ ] E. Microwave Cooking Equipment [ ] [ ] [ x ] [ ] F. Trash Compactor [ x ] [ ] [ ] [ ] G. Bathroom Exhaust Fans and/ Heaters [ ] [ ] [ x ] [ ] H. Whole House Vacuum System [ ] [ ] [ x ] [ ] I Garage Door Openers [ x ] [ ] [ ] [ ] J. Door Bell and Chimes [ x ] [ ] [ ] [ ] K. Dryer Vents [ ] [ ] [ x ] [ ] L. Other Built-in Appliances Scope of Inspection Owners Discloser form was not provided at time of inspection. We Do Not Inspect for lead base paints, which may be found in houses built before MFG dates given are estimates from the codes on the I.D. plates of the units, no guarantee of accuracy. We Do Not Inspect the following -Lawn sprinklers, Swimming pools and equipment, outbuildings, outdoor cooking equipment, gas lines interior exterior, water wells, septic systems, security systems, fire protection equipment, attic power vents, MOLD or any other indoor outdoor POLLUTANTS or FUNGI, condition of carpet, paint or other cosmetic items. Reports are intended to help potential homebuyers recognize and evaluate the construction details and overall condition of there prospective property. Since many of the structural components of a finished house are hidden, it is important to be able to judge the condition and quality of the building on the basis of the visible clues. The Inspection report reports on only the items listed and only the condition of the items at the time of inspection. NO REPRESENTATION IS MADE CONCERNING THE FUTURE PERFORMANCE OF ANY ITEM. 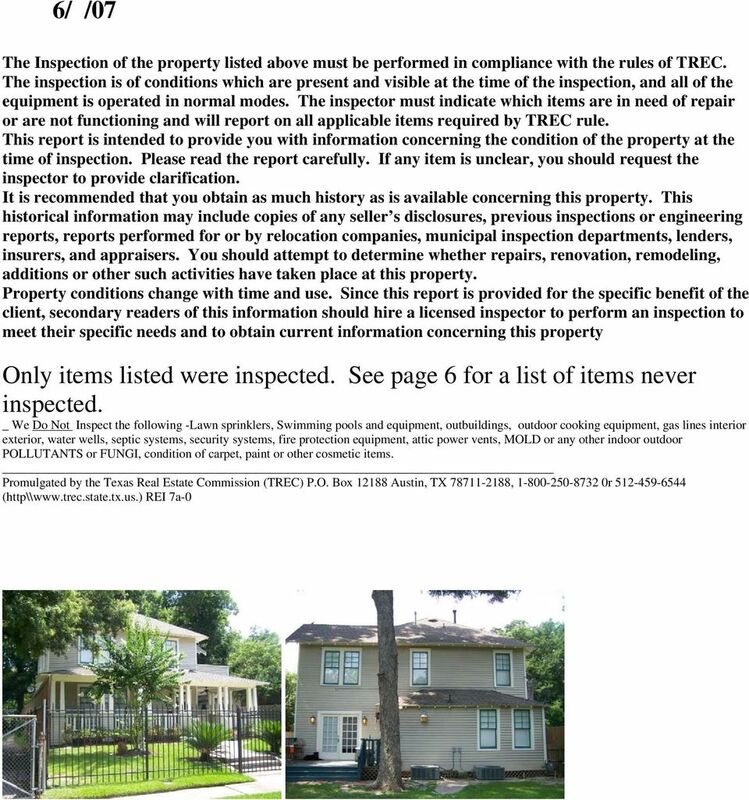 This report reflects only those items that are readily or easily observed at the time of inspection. Any area which is not exposed to view, is concealed, or is inaccessible because of soil, walls, floors, insulation, stored items, carpet, ceilings, furnishings is not included in this report. This report is not intended to be technically exhaustive nor is it considered to be a guarantee, home warranty or insurance policy of the future life or failure of the items inspected. In addition to the time spent at the property much time is spent preparing the inspection report so that it is easy to read and understand, please take the time to read the entire inspection report. We are dedicated to your satisfaction before, during and after the inspection. 111 Condo Circle Contents Property Inspection Report Information from the State of Texas and additional information from the inspector.